Punnett's Square: Can Ferrets Provide The Link to Brain Size in Humans? Can Ferrets Provide The Link to Brain Size in Humans? 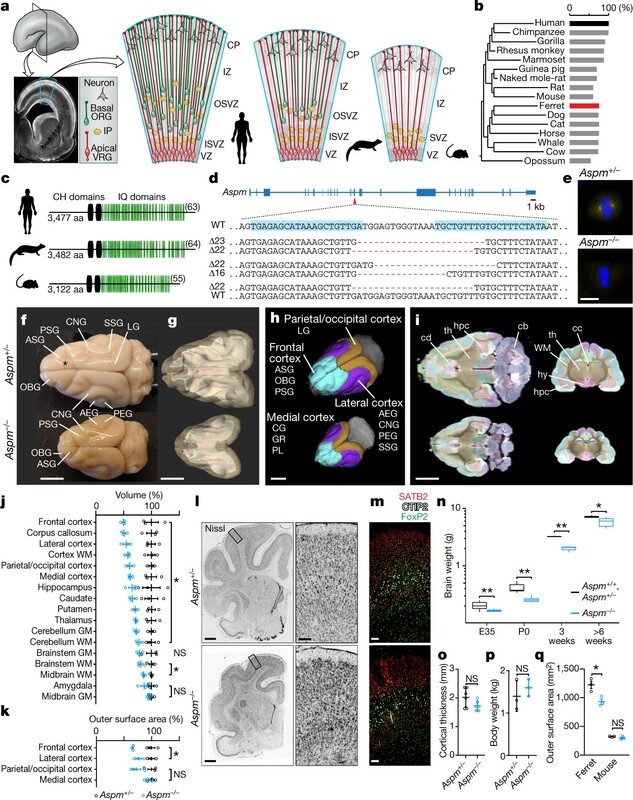 The research team in this article executed a new and exciting research procedure on ferrets that linked a gene known as ASPM to cortical size development. The ASPM gene is commonly identified in a disorder known as microcephaly, in which patients possessing a nonfunctioning allele for this gene display reduced cortical development. Although mice were also included in this study, the break through came in researcher’s inclusion of ferrets in addition to mice, because ferrets show brain morphology much closer to that of human thus making them excellent model organism for brain related studies. Researchers artificially silenced the ASPM gene in experimental groups of mice and ferrets and studied their rate of cortical development compared to control counterparts. ASPM was discovered to function very similarly to a magnet. A functioning ASPM gene increases the affinity of early neuron precursors, or radial glial cells, to the ventral zone. In the ventricular zone, these radial glial cells have the ability to continue to continue replicate, which then increases the abundance of cells that become neurons in the long run. Essentially, a lack of a functioning ASPM gene rush out of the ventricular zone and become neurons prematurely which also leads to less neurons in the long run. While this research study was great for defining the functionality of this gene in development, it is not to be thought of as a link to intelligence. I think by now we all recognize that intelligence and personality for that matter is a direct result of the environment and stimuli we are exposed to. While some genes may ultimately play a role in enhancing intelligence or any other ability, some degree of work and the experiences of the individual come together to form the mind as well. Labels: " "Gene", "ASPM", "Brain", "Development"
Great summary of of the research. Work in genetics, whether its to find the function of one gene or connect ancestral relationship always is significant and ongoing, and it goes to show that we truly do not know everything concerning the nature of human beings. I liked how you included a piece about the nature vs nurture debate. This was an interesting study to read! I know in my psychology class there were always debated regarding nature vs. nurture, this study goes on to show that both play a role in an individual's development.